Adventurous young mermaid Ariel, fascinated by humans, longs to explore their world out of the sea. After rescuing and falling in love with the handsome human prince, Eric, she strikes a deal with the sea witch Ursula to trade in her fins for legs in the hope of winning his heart. Ariel appears within the first four minutes of The Little Mermaid, released on November 17th 1989. She is first seen exploring a sunken ship with her best friend Flounder. In 1992 she starred in a television series set in Atlantica prior to her meeting Prince Eric. Subsequently, Ariel appeared in the sequel Return to the Sea, the prequel Ariel's Beginning and Ralph Breaks the Internet: Wreck-it-Ralph 2. The name Ariel means "lion of God" and can be used for a boy or a girl. 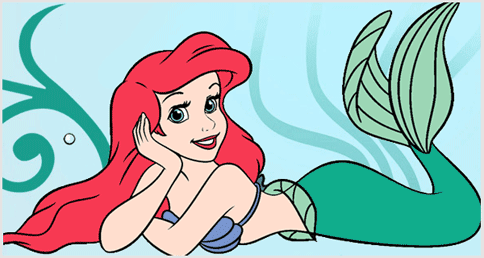 In the Hans Christian Anderson tale on which the Disney movie is based, the little mermaid remains unnamed. 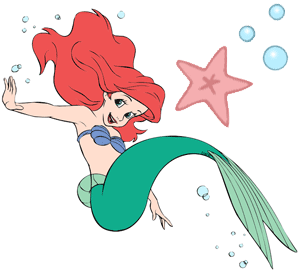 Hard to imagine the red-haired princess going by any name other than Ariel today. Ariel... Well, that's kinda pretty.